Beautiful rolled collar Chasuble has direct multicolored embroidery. Very traditional design with the Chi Rho cross and Alpha Omega. 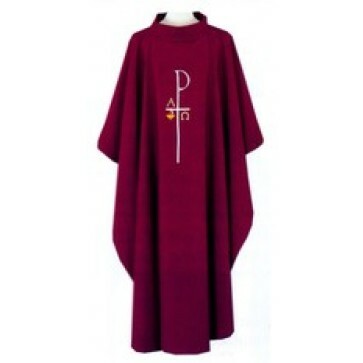 Vestments are machine washable, wrinkle resistant of soft polyester. Machine lined understole is included. Available in Off White, Red, Purple and Green.